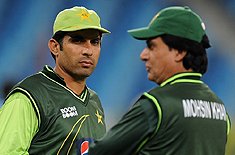 After Pakistan's successful series win against Test Number 1 Team England, Pakistan coach Mohsin Khan and captain Misbah Ul Haq, see their past denial by Board of Control for Cricket in India (BCCI) for including their players in IPL as a blessing. With their recent win in Dubai, marks their eighth win in their last 14 tests. While they have lost only one in the process. This has been attributed by both, the barring being instrumental in securing victories recently. Due to this the players have been able to take adequate rest, and were able to prepare well for different tournaments. Teams like India have subsequently suffered a lot due to this, and lost miserably against Australia recently.